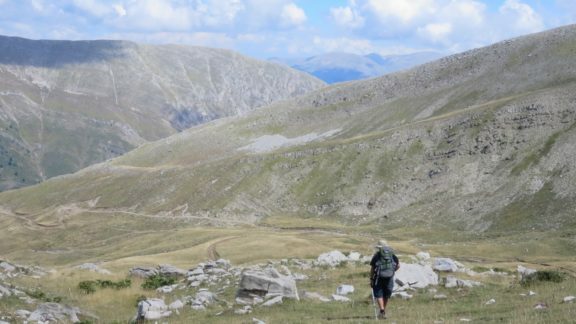 In 2014, Jane Laurie and her husband Alan completed a long-held ambition to walk from the northern border of Greece down to the shores of the southern Peloponnese. Jane first went to Greece at age 17, learnt Greek and subsequently bought a house in a Greek village. She worked for Holiday Which?, before changing career to work in Africa and Central America. This gave her the chance to go hiking in some of the remotest parts of the world: one highlight was climbing the highest peak in South Sudan, Mount Kinyeti in the Imatong Mountains. More recently, she has enjoyed walking long distance footpaths throughout Europe, from the South West Coastal Path to the Lycian Way. In 2018, she and Alan plan to complete their Greek odyssey by hiking across Crete. They live in Wiltshire and run a small organic vineyard.